Do you ever circle the neighborhood with a client looking for parking in DC? It might not be the best selling point for a new buyer or renter. For a lot of people, one of the most important components of finding the perfect home is finding one with available parking. Even in a transit-friendly city like Washington, D.C., the price and availability of parking could make all the difference in the world. Trulia and Parknav, a provider of real-time street parking data, joined forces to find the best and worst neighborhoods for street parking at peak weekday and weekend times. By scouring through the available homes to rent on Trulia, the team also determined the areas where renters had the best chance of finding a private parking or garage spot. 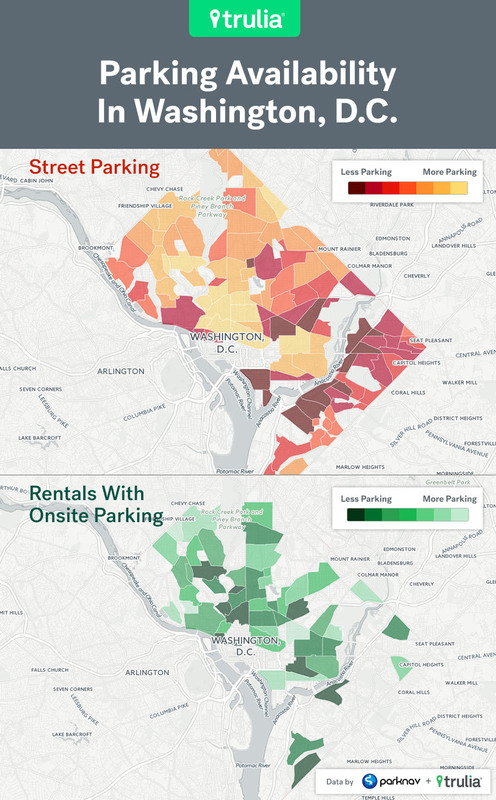 Washington, D.C. was ranked as the second-worst city to for parking, however, neighborhoods Lower Central NE and Fairlawn offered some reprieve for car-owning renters. Trulia and Parknav used street-level information to calculate scores by neighborhood. The interactive maps show the chances of finding a street parking spot in Washington, D.C.